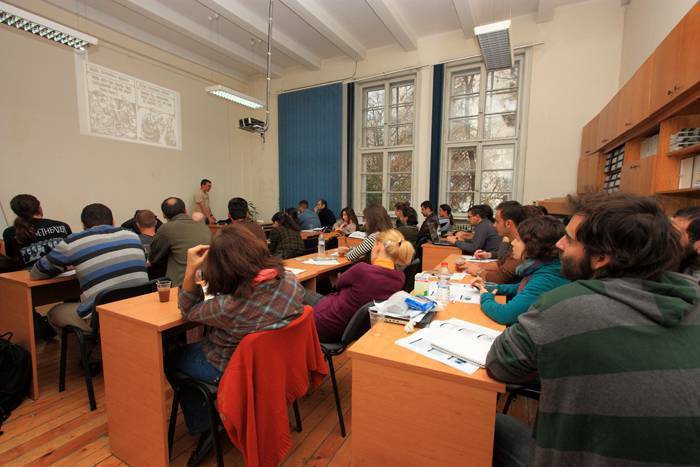 In the period 19-24.11.2012, a Conservation Science Workshop was held in Sofia, Bulgaria. The workshop was organized in close cooperation between the LIFE+ projects “The Return of the Neophron” (LIFE10 NAT/BG/000152) and “Save the Raptors” (LIFE07 NAT/BG/000068). The workshop was aiming to improve the capacity for scientific papers writing in Balkan environmental NGOs. It also intended to gather conservationists working with the Egyptian Vulture on the Balkans and to discuss potentials for future trans-Balkan collaboration on the species research and conservation. A total of 37 participants from 6 countries (Bulgaria, Greece, FYROM, Albania, Turkey and UK) took participation in the event. The lecturers were kindly provided by RSPB. Scientific papers on the globally threatened Egyptian Vulture and Eastern Imperial Eagle were drafted during the workshop and important discussions were made in terms of the threats and conservation of the Egyptian vulture on Balkan level. 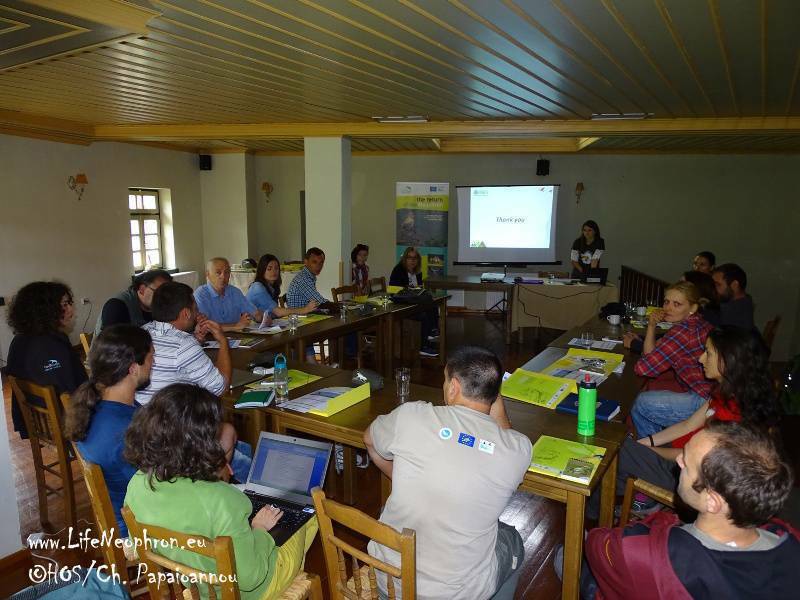 International training workshop for field research techniques of Egyptian Vultures was held between July 29th and August 3ed 2013 in the Eastern Rhodopes. The event was attended by representatives of environmental organizations from all Balkan countries where the globally endangered species still occurs: Bulgaria, Greece, FYROM, Albania and Turkey. The seminar was attended also by experts from the UK and Sudan – a key wintering area of the Balkan population. The aim of the seminar was to exchange current information about the species in the Balkan countries and through migration and wintering areas. In the first two days were made presentations on various project activities: techniques for monitoring of the breeding areas, nest-guarding, supplementary feeding, struggle with poisons in Greece, sampling, satellite tracking. Other presentations focused on the population status of the Egyptian Vultures on the Balkans and on cross-border cooperation between countries on the migration routes as a tool for species conservation. Next 3 days were dedicated to field work. Three juvenile Egyptian vulture were tagged with satellite transmitters, blood and pathogen samples were taken in order to determine the health condition of eight juveniles.This was an important practical demonstration for the participants in the seminar. They were involved in the process so that they can repeat the procedure in their own countries. During the event, experience was shared among organizations working for the protection of the Egyptian Vulture about the top gaps in the knowledge and threats for the Egyptian vulture in the Balkans. A Balkan level workshop entitled “The illegal use of poison baits in the Balkans. Conservation problems and solutions” was held in Papingo (Greece), on the 25-26th of May 2015. The workshop, aimed to promote the exchange of the existing know-how on the illegal use of poison baits among Balkan countries, as well as to increase the awareness on this huge conservation problem among the Greek authorities. Representatives from seven countries from the Balkans and Europe attended the workshop, together with representatives from several relevant Greek public authorities such as local Forestry Services and Directorates, local Municipalities, Environmental Directorates, Management Authorities of local protected areas, Hunting Associations, NGOs etc. The workshop provided the opportunity for all these stakeholder groups to come together, learn about the consequences of the use of poison baits and discuss openly about the motives and constraints that motivate this illegal practice and suggest possible solutions. The workshop participants also had the chance to see in action the Antipoison Dog Units that are operating in the framework of the LIFE+ Project “The Return of the Neophron” in the areas of Meteora and Dadia, and that so successfully manage to detect and consequently remove poison baits from the Egyptian vultures’ habitat. The main outcomes of the workshop were the agreement that this practice must be abandoned in order to save the last Egyptian vultures in the Balkans and the need of a commitment from the public authorities to actively fight against the use of poison. Presentations and outcomes of the meeting available below in section DOCUMENTS.